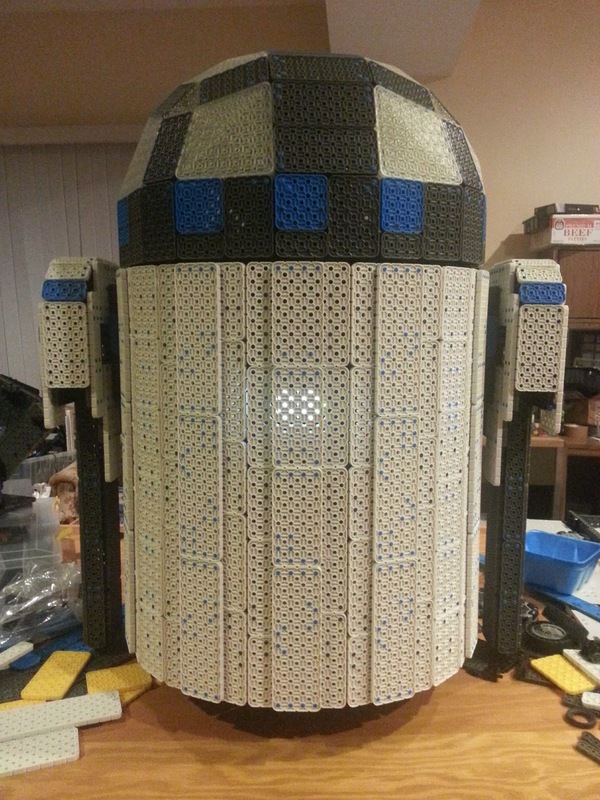 R2 has been to a few shows, and there are several things that need tweaked. Originally, the head-turning was driven by a single powered axle. That put a huge amount of torque on the axle (and gears) and turned pretty slow. 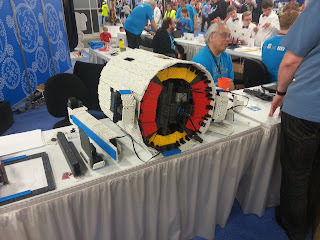 I don't have a pic of the first rebuild, but it had one wheel driving the plate on the bottom of the head. The second rebuild had four wheels driving the head. Sort of. I can't believe I screwed up the gearing like that. The third rebuild works very well. There will still be a wire coming out and attaching the brain to the LED sensor in the head, so the head can not spin 360, but it should turn very well. 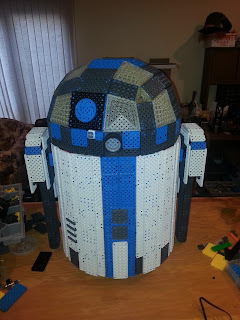 If anything happens to R2, like it gets knocked over, or I otherwise need to work on the inside, there is a very small hole in the body to reach through. That makes maintenance very difficult. On Sunday (Build day 327) I decided to make a removeable panel for the back. This will allow me to get inside and make adjustments as needed. There are four sets of magnets that hold the back on. Hopefully they will be strong enough to hold everything in place. 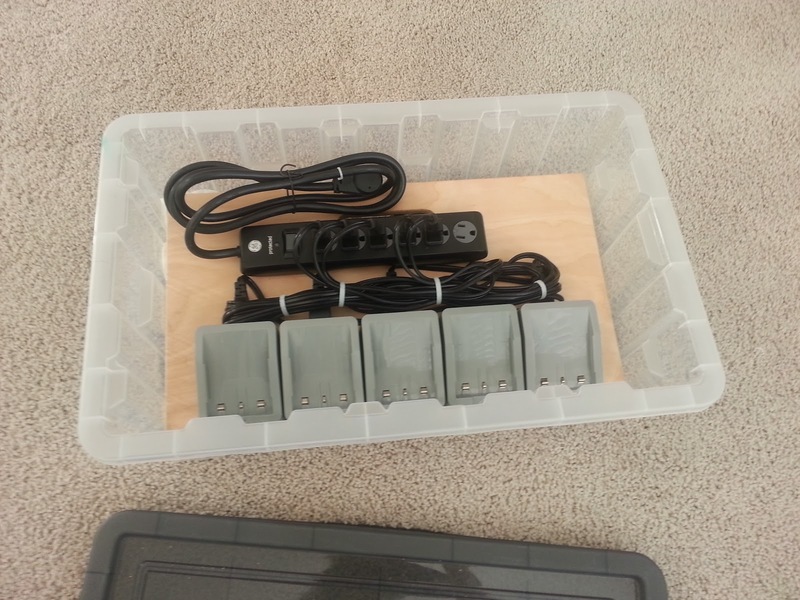 There is a small hatch on the back, so I can turn it on and off. I will have to take the back panel off to replace the battery. With the hatch closed, it looks clean. Over the years, I've spent more time working on Super Robo Rally than any other project I've ever created. 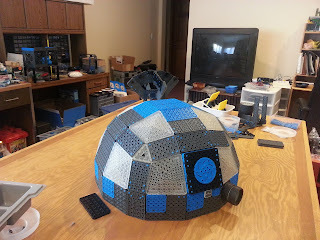 After starting on it in 2010, it's been through more revisions than I can list. 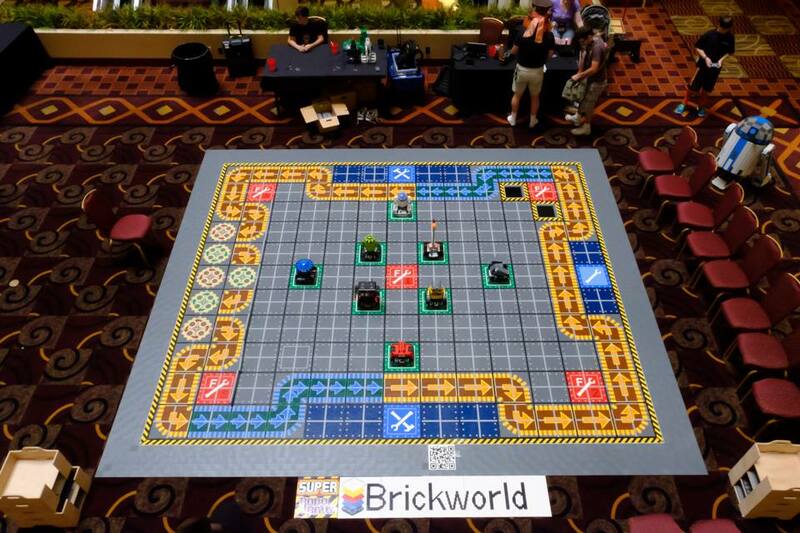 The current system uses a Windows 7 PC running C# code to control the game, and communicate with the robots. Over the summer, I will be working on Version 2. This version will move from the C# engine currently used, to a MySQL database on a Raspberry Pi, where the Pi can also communicate with the robots via Bluetooth. The best part about this, will be getting around the current weakness of Windows, where a PC can only communicate with 7 devices. The Pi will be able to use multiple bluetooth dongles to communicate with robots. I can't explain how much better this will make the whole system. I'll try to follow up as this progresses. 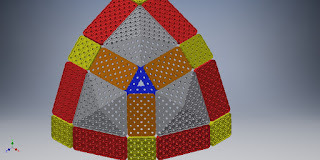 I designed a couple pieces in SnapCAD (CAD software for VEX IQ) and posted them on the web, asking if anyone could create an stl file. Within a day, I had a couple offers, and one very good file from David Knerr. 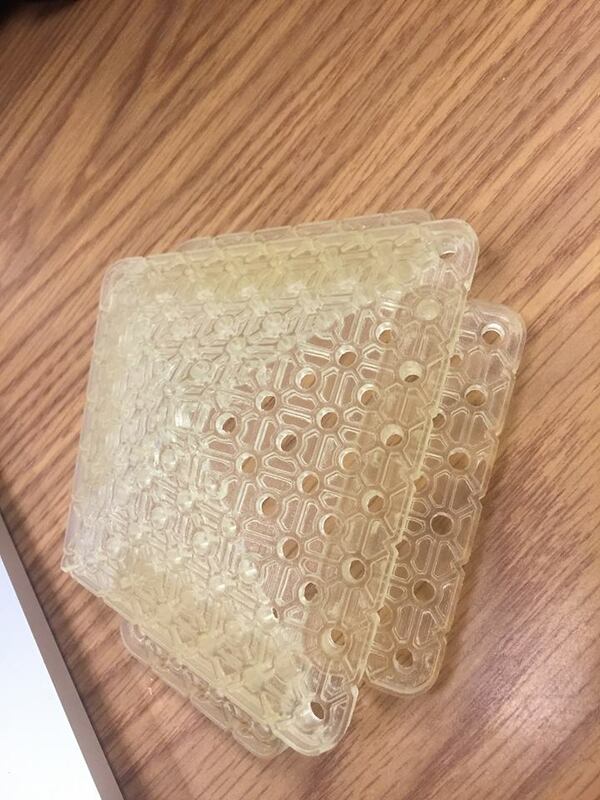 After we made a few tweaks of two parts, Davin printed the parts in one of Purdue Polytechnic's labs. 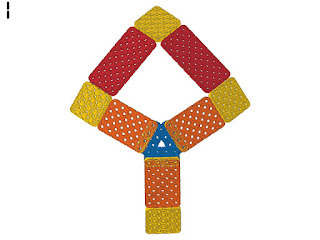 The two parts consist of a triangle-shaped piece (4x) and a diamond-like polygon (12x) which together fill all the area in R2's head. 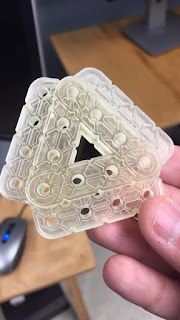 The design of these parts allowed me to remove much of the internal structure that was required to create the original shape. The most time consuming part of assembling the new head was putting 240 pins into the 3D printed pieces. 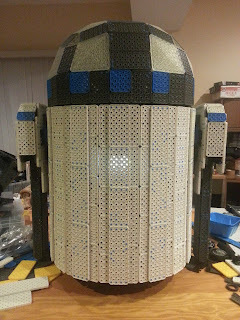 Once it was complete, the new head has a lot less panels inside, and is much more rigid than the previous one. 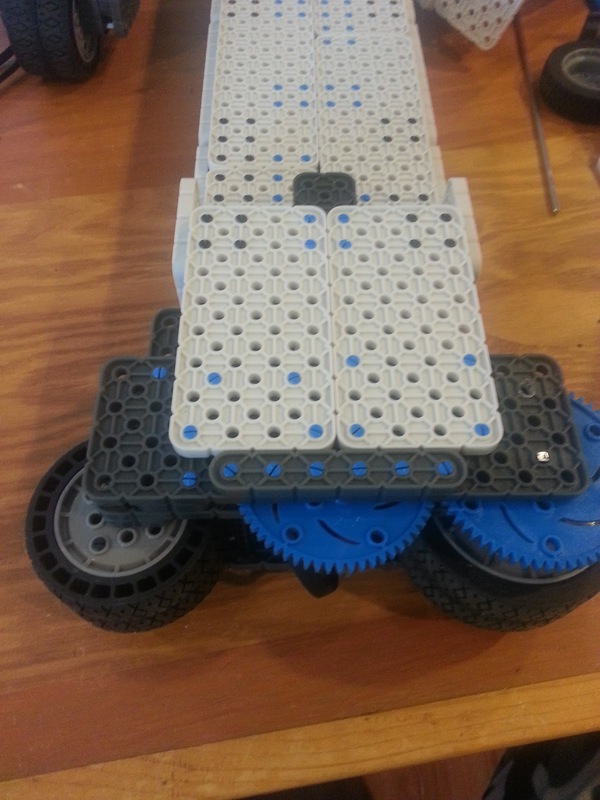 The head is mounted on four rollers, which previously only raised the middle enough to stabilize it. 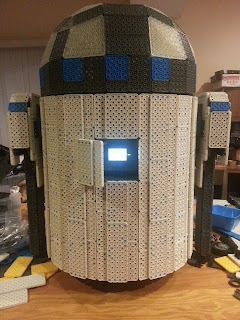 Now, there is actually a small gap between the head and the body. The new design drives a couple small wheels that the head is sitting on. It's much freer to turn, and slip when people try to turn it manually. The drive for the head was originally a motor & worm gear that turn an axle connected to the head. This put a great deal of torque on a couple small pieces, especially when people would walk up and try to turn the head by hand. The real challenge with R2-IQ has been making it round. 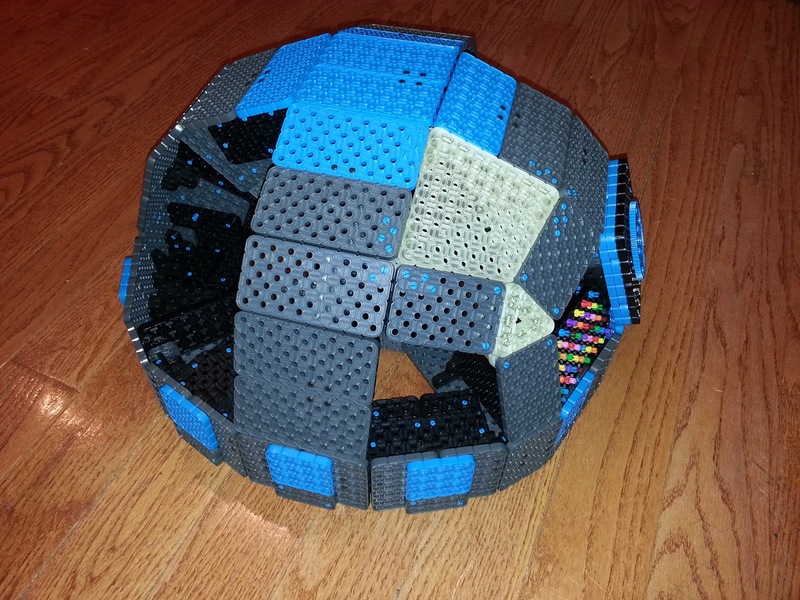 It's one thing to make a cylinder for the body, using the square VEX IQ parts. It's another thing to make the head. 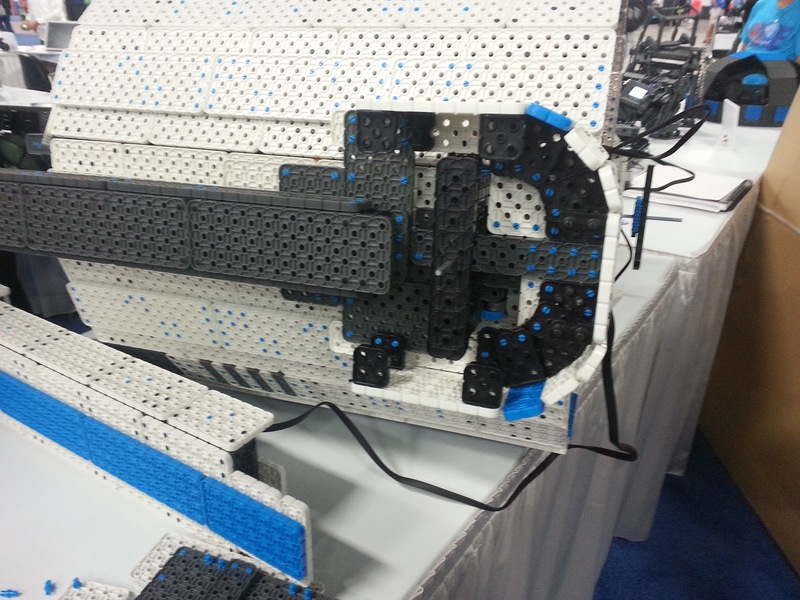 In SnapCAD (VEX IQ modeling software) I drew up a part that I thought would help. I posted my picture on line and asked some friends if they could help make a file for a 3D printer. I received a reply from someone I didn't even know with this drawing that looked better than my original one. "I didn't know the angles, so I used 70 degrees." As near as I could tell, I wanted them to be about 18 degrees (or 72, depending on the reference) In a very short order, he had a new drawing, and thanks to friends (Davin) at Purdue Polytechnic, I had the new part printed in no time. "Well, that was easy. But can you make a part to fill this hole? ", I challenged David. We discovered the actual angle of the original part should have been about 13 degrees. I'm not sure how to calculate that angle. I'm sure someone can. 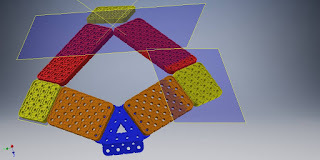 David did it by lining up all the other parts in CAD and having it tell him the angle. 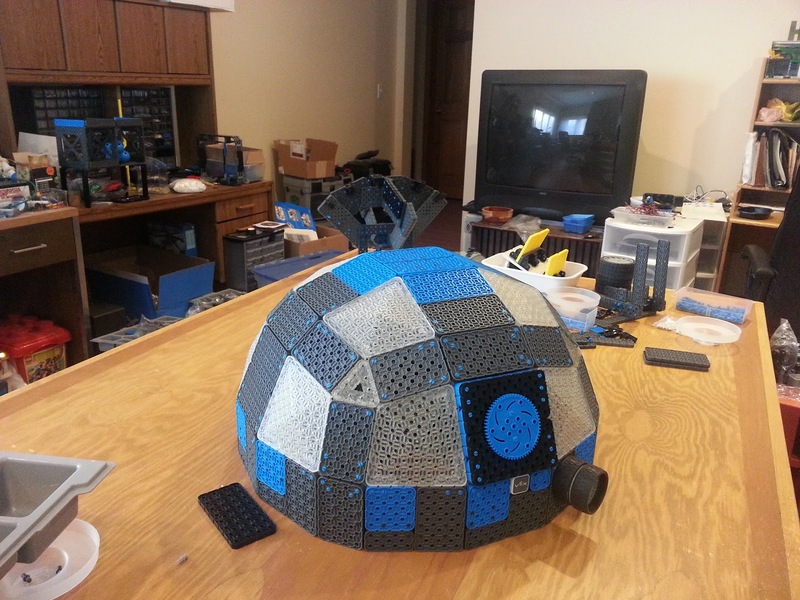 In no time we had a new part design, which would fill the holes in the head. After printing it, the part appeared to be a bit too "pointed". 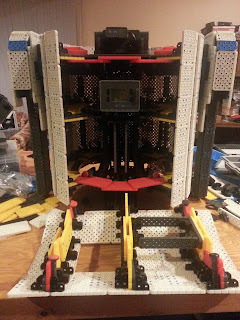 So, instead of it being flush with the red & orange pieces, it was offset to an 11 degree angle. Basically, I asked him to push the point in, while leaving the attachment points in the same place. The new (purple) piece has a very nice curve. 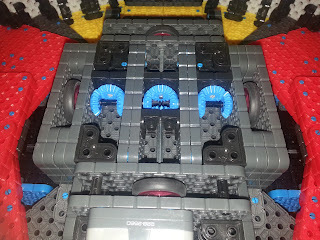 In addition, it has enough connection points that I should be able to remove most of the internal structure. 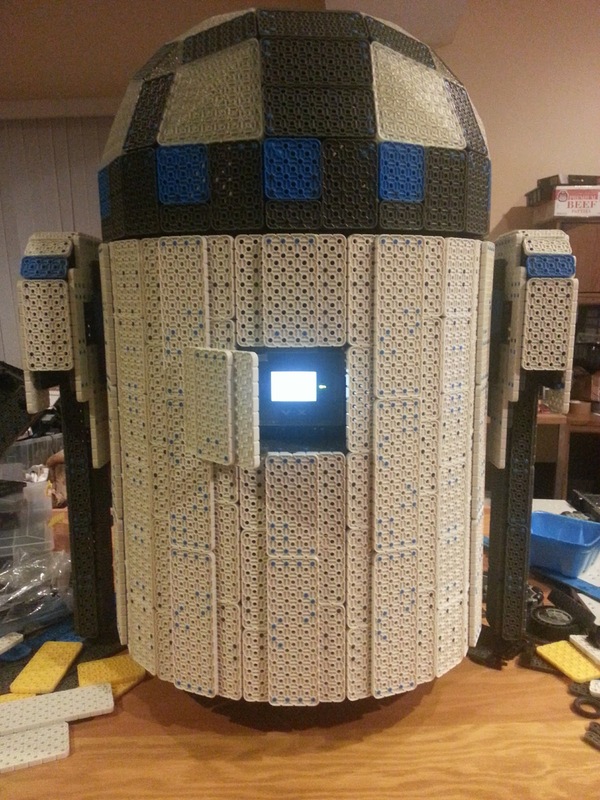 The first picture of the head with the printed parts installed. The curve looks very good. 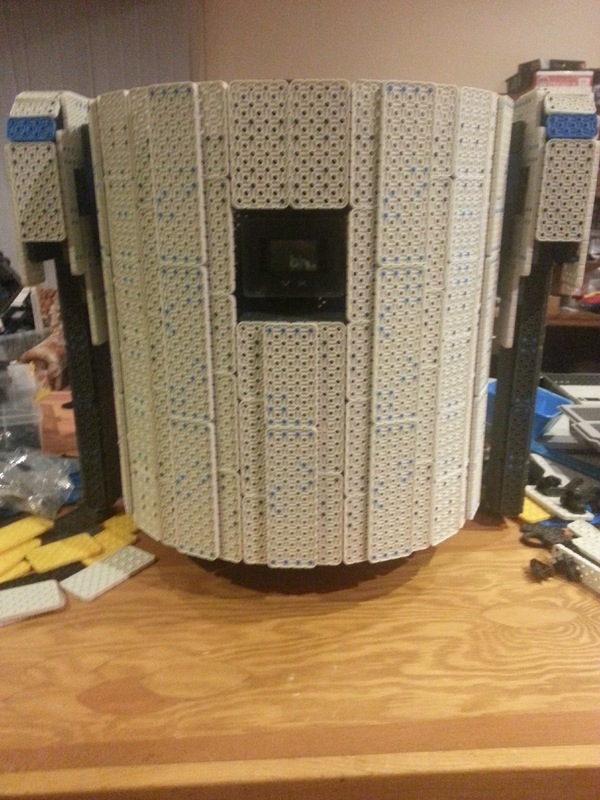 I started this post a few weeks ago, and didn't complete it. 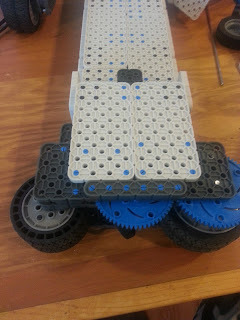 Before VEX Worlds (in April) I made some tweaks to the feet. At Brickworld Indy, I had issues with the axles coming out. So I added more support, and didn't have any issues with them for the 4 days it drove at Worlds. However, I did still have an issue at Worlds. Turns out trying to back over holes in the floor would cause the legs to buckle and he fell over. 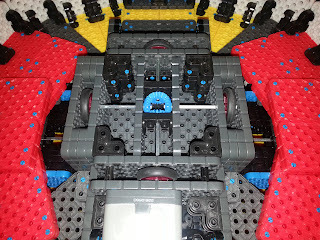 This is a look inside the arm. I wasn't sure if I had posted any pictures of the shoulder, so I took this shot. I had an idea to fill in the head. 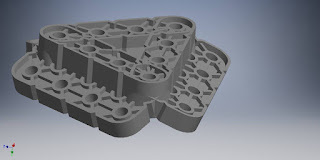 If I can get four of this part, it will allow me to put several plates in place to help create a curve. This was drawn in SnapCad, and has "wings" at 18 degrees. Here's a bunch of data I've collected about teams attending VEX IQ Worlds Middle School division in 2016. It should be noted that this data has come from different times in the season, from various tournaments, and also Skills events that sometimes do not host Teamwork events. While it may provide some comparison between teams, each team's results in qualifying and in the finals depends a great deal on other teams at that event. This table does not indicate how much a team may improve between the tournament listed, and Worlds. This table lists the tournament from which this data was collected for each team. The Program and Driver Skill scores are pulled from the tournament listed, or the World Ranking, whichever is greater. "All Avg" is the average score of all qualifying matches for that team. "Used Avg" is the average, not including scores that were dropped. If teams don't have a score in a category, a value of zero is used. *** this data was pulled live from the web site, and that web site has been updated, so the data is no longer available. With a couple big projects and four VEX IQ teams, the chargers can quickly get out of control. 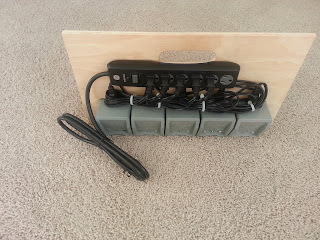 So, I built a charging station to keep things in line. The back is simply a piece of wood with a handle cut into it. 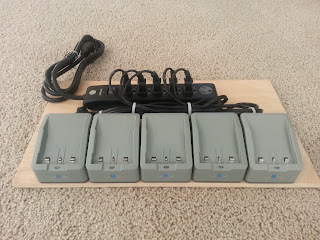 The power strip is attached by screws, and the chargers are attached with 3M VHB double-sided tape. All designed to fit into the VEX IQ storage box.